Taiwan's exports decline for the ninth month. 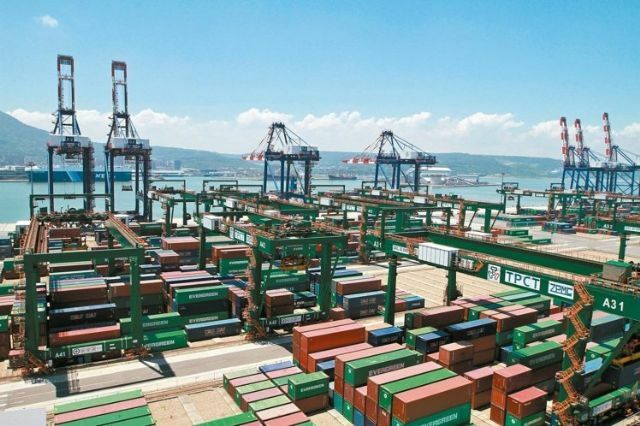 According to the Ministry of Finance (MOF), Taiwan's exports have fallen for the ninth month so far this year on year-on-year basis, to US$23.9 billion in October. Nonetheless, the ministry feels the island's exports will grow stronger in the fourth quarter than in the third quarter and will swing to positive growth soon based on three signs. In October alone, the export value set a fresh five-month high, with many categories of exports registering reduced rate of decline. Moreover, Taiwan's export to Asia considerably improved. The October value represented a 6.2 percent increase from a month earlier in spite of the double-digit rate of decrease from the same month of last year. Taiwan's import of US$17.82 billion in October represented an increase of 3 percent from the previous month albeit a decline of 20 percent from the comparable month of last year, marking the eleventh month that the figure had dropped year on year. The October export produced a trade surplus of US$6.12 billion for Taiwan after deducting the import, to result in total surplus of Taiwan's international trade to US$44.66 billion in the Jan.-Oct. period. Both the October monthly and 10-month surpluses set new highs, according to MOF. Senior MOF officials predict the rate of decline of the island's export to drop to single digit over the next two months should the monthly figure reach US$24 billion, which they think is likely to happen in consideration of the usually robust re-stocking towards year-end for the Christmas and Chinese New Year shopping season. The island's exports slumped 13.9 percent year on year in the third quarter, the worst of this year, according to MOF. In the Jan.-Oct. period, Taiwan's exports totaled US$236.31 billion, sinking 9.6 percent year on year. MOF officials feel the rate of recession will not escalate for the rest of this year given the slowing year-on-year decline rate in the past three months. Director General Yeh Mann-tzwu of the ministry's Department of Statistics points out that the line between the high and low seasons is quite blur this year, underscored by the reality that seasonal surges often materialize in the low season instead of in the high season. The ministry's statistics show that in October all of Taiwan's export categories but base metal and machinery posted reduced decline rates, with electronic-product category seeing downtrend slow to an annual rate of 4 percent coupled with export revenue of US$8.79 billion mostly thanks to increased demand. Of the electronic-product category, solar battery alone posted a year-on-year surge of 21.1 percent, or US$40 million, to mark the biggest rise. Although Taiwan's exports to Asian economies remained weak in October, its export to mainland China and Hong Kong together improved, with the rate of decrease shrinking to 11.1 percent year on year. Yeh notes the island ships around 70 percent of its merchandise to its Asian neighbors, so it is encouraging to see the rate of decline of its exports to this region slowing to 10.9 percent year on year in October from the third quarter's 15.6 percent. She feels the improved export to Asia will help the island's export as a whole in the final quarter.